The Bede BD-5 is a series of single-engine single-seat homebuilt sports aircraft designed by American Jim Bede. 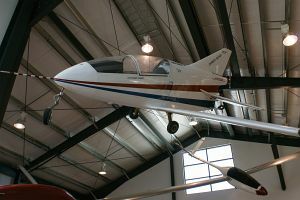 The kit was produced by Bede Aircraft Corporation. The variant BD-5J is powered by a small Microturbo TRS 18 turbojet engine with 1.45 kN (326 lbs) thrust which makes it the world?s smallest jet aircraft. It can fly approx. 260 kts (483 km/h - 300 mph). The propeller driven variants can be powered by several different engine types. The BD-5 was offered with different wing spans. There was also a turboprop powered variant (BD-5TP) available.